By Peter Anderson 4 Comments - The content of this website often contains affiliate links and I may be compensated if you buy through those links (at no cost to you!). Learn more about how we make money. Last edited November 18, 2017 . 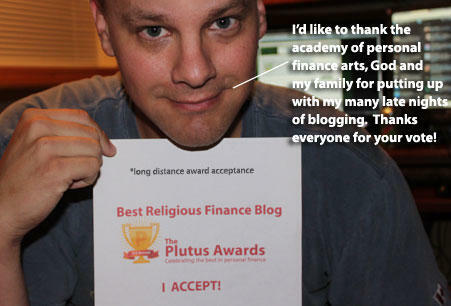 A week or two ago we put out a call asking for your help in the voting for the Plutus Awards, a personal finance blogging awards show put on by Luke over at Consumerism Commentary and others in the personal finance community. The show had a live ceremony last night to announce the winners at the Financial Blogger Conference, a nice kickoff to a weekend of great personal finance and blogging content. I wasn't able to attend this year unfortunately, but I was able to follow the awards ceremony last night thanks to Briana (@howsmarriedlife), who was live tweeting the event. You can check out the stream from last night by going to the hash tag on Twitter, #plutusawards. 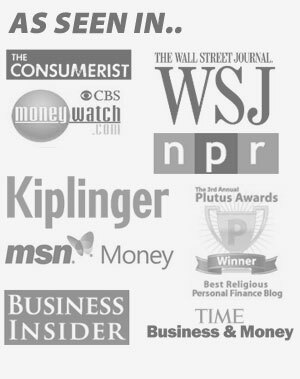 After a rousing musical number from Kevin at Thousandaire, somewhere near the end of the show, the award for the “Best Religious Personal Finance Blog” came up, one where I was one of 5 finalists. Here's the announcement of the winner posted on Twitter by Briana. I couldn't not participate in the ceremony, right? There were a lot of great posts this week, I thought I'd highlight a few of my favorites here. I should note that a majority of them are from Minnesota personal finance bloggers. Go MN PF Blogs! Tragedy Strikes Close to Home: Why You Need to Have Life Insurance: Great post from Jason over at WorkSaveLive.com talks about the importance of Life Insurance after his friend's brother's pregnant wife and unborn child passed away after unknown complications came up. Head on over and read, and if so included, give a bit to help out the newly widowed father. Why Most People Don't Pursue Side Income: DC at Young Adult Money explores the topic of side income, and why more people aren't trying to make money on the side. One reason? It's hard work! Stop being so lazy people! Is A Home An Asset Or A Liability? : Kraig looks at the idea of home ownership, and whether a home is really an asset or not. He cites some ideas from Robert T. Kiyosaki, in his book Rich Dad, Poor Dad – which while I'm not always a Kiyosaki fan, I think he still has some worthwhile ideas. Post is definitely worth a read. Does Money Make You Mean? : Aaron at Three Thrifty Guys talks about the idea of how money can become an all encompassing pursuit, and take over your life, much like the pursuit of the ring took over Gollum's entire life in The Lord of the Rings. Be Careful When Choosing Automatic Payments: Christina at Northern Cheapskate discusses how important it is to make sure when you're signing up for auto-pay or paying for things in advance, that you're actually getting the best deal. You might be surprised to find that what is advertised as the “best deal” truly isn't. Running the Gauntlet that is the New Car Dealership: Great post from PTMoney about buying a new car, from start to finish. One to bookmark for when you start car shopping. I Paid the Stupid Tax: Ryan at Cash Money Life details his harrowing trip to FINCON12, and how he paid the stupid tax. Fun read. So there you have it, check out those great articles, and have a great weekend! Big congrats on the award, Pete! It’s well deserved…and those were some definitely strong competitors that you had! Thanks for sharing my story again as well! Congrats on the win! And thank you for including my post! Congratulations! I enjoy your informative blog. Next Post: Tithing: Just How Are We Supposed To Give Anyway?